– You can’t preserve culture. It is made every day. – If you want a certain culture, do those things. – Management can set priorities but they need to do them. – Do you want the same culture after growth? Cultures don’t necessarily scale. Culture of 30 doesn’t work with 80. – New people will change the culture. You can’t avoid it; you can try to steer it. – who gets the beta? – stop doing beta. Deliver faster, do fewer changes in each release. – Can customer tell what they are looking at? – How would you find errors? – Variation by itself isn’t a problem; incorrectness is. – Do pages get audited? – encourage brevity: measure it. – If what you want to say doesn’t add value, don’t say it. – Learning questions: Instead of talking about what you did, talk about what you learned. – Be aggressive about the rathole call: if the discussion is wandering, call people on it. – Don’t have the standup in a comfortable place where people relax. Stand up; make people want to finish and get back to work. – Who owns each channel? – Does old content get pruned? – Tell a story. Don’t just recite facts. – are you trying to influence behavior or just convey information? – Always question priorities. Are we doing the most important thing? 1. How do you describe Agile? —who are the customers in your context? – Do civil engineers do a lot of projects that are information based or are adaptable? – Buildings iterate less well, where is the iteration? – Personality trait? Learned skill? 3. How do you get your creative flow going? – Should I be doing something? Yes or No? No? Don’t lie, just do it. 4. How do you work with other groups to determine backlog priority? – visibility of the job? 7. 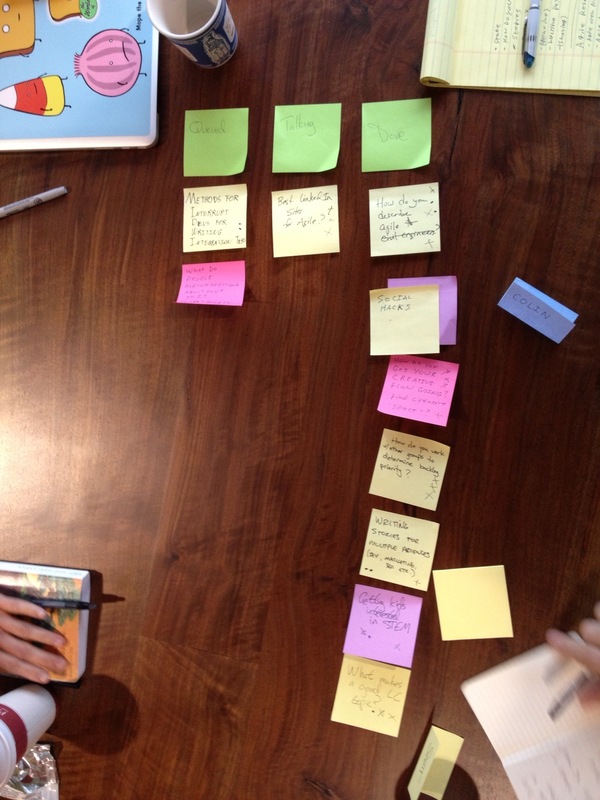 What makes a good LeanCoffee topic? – opinion with commentary vs asking for help. 8. Best LinkedIn groups for Agile resources? – She is finding this question popping up across LinkedIn groups- Agile Alliance, Agile Project Management; will try to direct to Agile Project Management (non-software). A very large picture is put on the wall. Then covered with post-its that represent behavior changes to make (e.g., pair on a task). 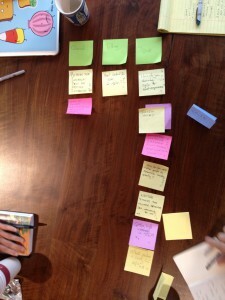 As team members complete the behavior change tasks, they remove the post-its. The first team member to guess what the image underneath is gets a prize. Behavior changes are put on a clipboard. A team member caries the clipboard and visits team members reminding them of the change. This is not a governance activity, but a reminder. Justin points out that a group has to get to planning actions before they can follow through on them. Considered using a technique from above as “bait” to get a team to form actionable changes from a retrospective. Framework for learning from Willem Larsen. Featured in the book-in-progress Name This Book. 5 Items: Alive, Fluency, Signal, Focus & Setting. If you take only one thing from the model, create learning environments that recognize people’s humanity. Noted that the “environment” and setting for retrospectives can greatly affect their effectiveness. Water-SCRUM-fall, is it worth the pain? When a program is structured very large and slow, with a staged release plan (e.g. in the first year, we’ll build the db…) but is to be run “agile” this causes pain for teams. What do to? Team members tend to see activities such as iteration planning, backlog management, retrospectives, demos, etc. as “stupid” and “a waste of time”. progress toward a goal. Team may need to set its own sub-goals, if the business isn’t providing them. Need to get the big program focussed on results. Outcomes, not output. changes that would come from producing a result. How can Agile and Kanban be used in organization design? Common models for org. design include Jay Galbraith’s Star Model. And the sociotechnical system. Federated models and Agile/Kanban go well together. I’m in a rut. How do you break out of ruts? The Plateau Effect may help. What about the 5 rules of Accelerated Learning? Try getting others to see the same problem you see. Then you are not alone in working on the problem and not alone in the rut. Ruts represent a conflict of desires. Boredom comes from prevention from doing what you want to do. How do you use Lean for your extra-work creative projects? Books: Personal Kanban, Factory of One, David Starr has written a book about it, featured in WSJ. Beware the tyranny of the list. Kanban does not remove this. Differentiate between “holding” and “blocked” items. Can try to sort tasks by size. Then when presenting with time to take on a task, grab one that fits the available time. Briefly touched on family retrospectives. Merging (through acquisition) two products that overlap in both audience and functionality. Anti-recommendation: bigwigs decide how people will work, ignoring realities. Instead, try to bring people doing the work together early and give them a chance to solve the problem from the engineering perspective. Create value teams. What does success look like? What will failure look like? Is there common understanding of the overlap? Figure out how to make the people excited about doing the work – technical challenges? how will it build their careers? Recognize what’s been learned so far. What do the people stand to gain? LeanCoffee is off to a great start. We’ve moved to the amazing New Relic offices on the 28th floor downtown and the conversations have become as soaring as the view. Often New Relic employees showing up bleary eyed to work encounter a passionate discussion raging in their lunch room and wander near to see what’s got everyone so charged up before 8 in the morning. LeanCoffee is great for sharing and learning. Its agenda-less nature lets the group determine the most interesting topic and spend the most time discussing them via democratic voting. Looking at a single topic from the last session, here’s what I leaned in just the first 10 minutes. Fresh from ProductCamp this weekend, I was turning over the role of Product Owner in my head. At AgileOpen NW, I was surprised to hear knowing jabs at the role. In such an inclusive and supportive environment, it seemed out of place. Or perhaps I was just sensitive as that job is what I do for a living? Why are people so disappointed with their POs? I came across this attitude again while getting my Scrum Master certification. In the small class, the teacher was surprised to have a PO interested in taking it and over the course of the two days I heard many more snarky digs at the role. What gives? 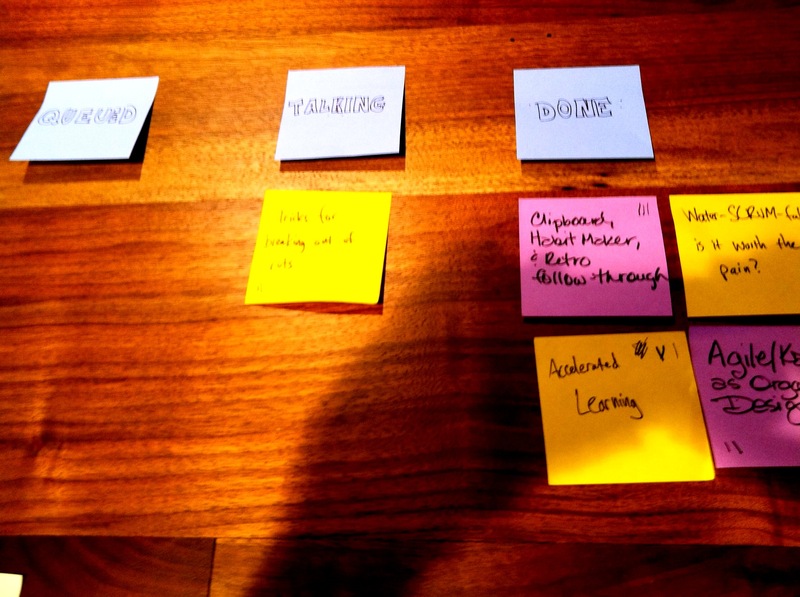 So in an attempt to use the LeanCoffee format to tease out an answer, I suggested the topic “Product Owner faux pas”. It got the most votes and was the first topic of conversation. We ran through the first 6 minutes then two additional 2 minute sessions (10 minutes total). People were all too happy to share where they’ve seen POs fall down and I learned a lot. Diana suggested that while the role seemed like a good idea during the creation of Scrum, none of the architects had actually held the role. I offered that the Scrum coach mentioned the PO is often not treated as part of the team. Upon mention of proactive backlog grooming and story estimation: Oh, I wish my PO would do that! In just a few minutes I learned pain points from the perspective of teams and POs which can immediately help me be better in my job. That’s the beauty of LeanCoffee: lightning rounds and rapid idea exchange around highly interesting and relevant topics. Creating a Rumor Control Board on the wall to allow for not only the validation and squashing of rumors, but also the frame that until validated by someone, a rumor is only a rumor. Above all the session is infused with laughs and mutual support. It’s a great way to wake up: getting caffeinated with smart people and sharing unexpected ideas and war stories. I’ve always left richer than when I arrived.